Time just flies - we still feel like the year has just started, but reality is that 2012, believe it or not, is halfway over and we’re now in the second half of the year. In the past six months, we’ve seen some great products we only dreamed of. First came the third-gen iPad with a screen packing 2048x1536 pixels of resolution, effectively beating our wildest dreams, and then the Samsung Galaxy S III finally arrived and it’s the exact beast of a smartphone we all waited for. In platforms, Apple and Android cemented their lead leaving no space for others and occupying virtually all of the market. So, let’s take it from here and recap what happened in the first half of the year. Also, we’d like to hear from you, our readers - which of all those events was the most important one for you? If you had to go back through these past six months in technology, can you pick a single event that will shape the future? We’re looking forward to your answers in the poll below and we’ll publish the results by the end of the week! Android finally caught up in apps not just in numbers but in quality - the best apps are now launching almost simultaneously on iOS and Android, sometimes even first on Android. When it comes to tablet optimized titles, though, Apple still has the lead. The Kindle Fire started in late 2011, the Samung Galaxy Tab 2 7.0 picked it up in April, but the affordable tablet business will really take off in the second half with the arrival of the Nexus 7 tablet. Big phones, phablets, call them whatever you want but the what Samsung started with the Galaxy Note was a huge success. The Note sold over 7 million, and while we still find it hard to use single-handedly, the device has grown on us and many users. Adobe Flash won’t be supported in Jelly Bean, it is not supported on the default Android Chrome browser and on mobile devices it’s dying even faster than we expected. The Galaxy Nexus was the first huge victim of the Apple’s legal battle with Samsung, and the big loser here were end users. So while patent law definitely makes sense in many cases, often times in these first six months we felt it was a huge deterrent to innovation. The Android 4.0 update arrives painfully slow - it’s still on just 10% of existing Android devices. On the other hand, though, while not an excuse, it should be mentioned that there’s such a huge number of Android devices out there and so much variety, that it’s mostly carriers and phone makers fault, not Google’s. Nope, no Ice Cream Sandwich for you yet! And it’s running on Ice Cream Sandwich, and it is pretty much everything we hoped it’d be - thin, powerful, with a gorgeous huge screen. For Nokia, the first Windows Phone devices didn’t bring enough sales, the company slumped worse than expected. All major credit rating agencies downgraded the Finns’ stock to junk, and it seems that only a PureView Windows Phone or some kind of a “Plan B” can save the company. The executive duo of RIM co-creator Mike Lazaridis and Jim Balsillie stepped down and little known tech expert Thorsten Heins took over, but nothing seems to have changed and under the new executive sales continued sliding and BB10 was delayed. There are now 600,000 apps on Google Play, very close to the 650,000 apps on Apple’s App Store. Android’s market has grown tremendously by nearly 200,000 apps in four months, and we expect it to outgrow the App Store over the next couple of months. While Apple can be criticized for a lot of things, and it should be as it’s now the world’s largest company, the company did make significant progress with the way it treats employees in China. Apple hired an independent overseer, raised wages, and put an end to unlawful lengthy overtime. With its PureView technology on the Nokia 808 PureView, the Finnish company set the record straight as to who has the best cameraphone. Sadly, the 808 PureView runs on the now terribly dated Symbian, which makes it less of a smartphone and more of a camera. 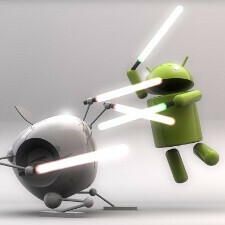 It’s a duopoly for smartphones and the smaller operating system no longer stand a chance. webOS is going open source, MeeGo got the boot, bada is quietly slowing down and obviously put on the backseat for Samsung, Meltemi never even got official and odds are that other upcoming smaller platforms like the Firefox OS and Tizen don’t stand a huge chance of survival. Intel’s Atom chip is now on smartphones and it’s relatively battery-efficient, but the first devices with it didn’t make a huge splash and it’s still largerly an ARM world. While everyone is struggling to squeeze out a profit out of smartphones, Apple is flourishing. The company in Cupertino has got $74 billion in overseas cash reserves and the highest market evaluation in the world. In the first six months, more and more of our files flew into the cloud with all kinds of services. Since Android is so massive, the launch of Google Drive was the biggest news, but Apple is also successfully running its iCloud, Microsoft has the most storage with SkyDrive, and Dropbox is becoming the most popular platform-neutral option for storing your files. Android’s open source nature finally starts showing up and with Google’s Project Glass and game consoles like the upcoming Ouya we got a taste of a future where computers will be embedded in our lives. The RAZR MAXX showed us that you can cram in a huge battery in a smartphone and have it run for a full 24 hours without dying and that now seems like a huge deal as we get larger screens and phones struggle to last it through the day. Verizon Wireless, the US biggest carrier, finally got shared data plans at the end of June, but they are not all that much of a deal. While you can get 10 gigs of data on T-Mobile for $60 a month, on Verizon sharing 10GB will cost you $100. yeah but a resolution that high is unnecessary. The human eye can't spot the difference between 1920x1080 and 2560x1600. They would pretty much look the same. I bet we will see a 1080p HD display tablet in Q4 this year. "Retina display" is a gimmick, just like Siri, the asymetric fan in the new macbooks, and quite frankly, apple products itself. Why are iProducts selling so well? Well, lets just say that the world is populated by a large number of not so bright people. I like the way you think, too bad not everyone here thinks like you. Siri can be a gimmick, just like S-voice(and a couple of other SGS3 features) but a lot of people use those features, because it works and does the job right. Now Retina Display is far from a gimmick, we have been seeing a revolution in mobile displays, not just Apple products, so i could say that other screens in other smartphones are also gimmicks due to their high pixel density. All Apple did, was being the first to release on a phone. On tablets we had seen a cool high resolution screens but the iPad 3 screen was brutal. And they also released on the macbook. It's not a gimmick. It as it's uses. And by your point of view, the "large number of not so bright people" also includes people who buy Samsung and other companies products? Think about it, High resolution screens, Voice search apps. Aren't they gimmicks, if you say the retina and siri are? I agree, but Apple was not the first with a "retina display" by its own definition. The LG enV Touch had a 311 ppi screen and was released before the iPhone 4 was announced. i know. i was one of those... lol. we android fans get carried away with specs sometimes and I'm sorry for that. if you ask why we argue with apple fans for having much faith in Apple, it's because they buy the product without looking for alternatives and buy without knowing the product itself. couldn't agree more.. they blindly buy the products without knowing it and without looking for better alternatives. long gone is the days where the only device that works is iPhone. Yes, the iPhone works, but Android/WP/Symbian/MeeGo works better..
Can I have an option that says "All of them''? I didnt vote...but I would pick the patent wars, big phones. Maybe its still a dualopy. But..big phones were a success starting in 2010 with the EVO and Droid X1. Those 2 phones were in the top 3 phones sold in 2010. I meant top 5 phones sold. A lot of these are big stories that garner a lot of attention but if I had to choose the most important, I'd go with Apple stepping up employment oversight. Improving workers conditions is more important than getting updates on a new tech that will probably be outdated in a years time or less. there are WAY too may options to vote for. The voting should have allowed multiple choices. What about the Microsoft Surface announcement? So far, I'd say that's the one event that will most change the future of the tech industry. yes, it is more important than the sharing plan from Verizon, and it's more acceptable by people on the other side of Atlantic ocean. The Samsung Galaxy S III is here, and what kind of idiot would put "Apple is even richer now"
How come Surface was not included in the list? ?